How Do Horses Experience The World Differently To Us? / How Do Horses Experience The World Differently To Us? How do you experience your world? As humans, in general, we experience our world in sights and sounds. We gather data from those senses, secondarily from our other senses, and then we process and analyze the information. Why do we rely heavily on sight and sound? Our sense of sight is our most developed sense. Our next best developed are hearing and touch, though they are no more developed than some other primates. Our sense of smell and taste, related senses, are our least developed. Our perspective of the world is created and defined based on sights and sounds. Think of all advertising. It is based on what is culturally considered visibly and audibly appealing. The senses of taste, touch and smell are rarely used. It makes sense that we rely most on vision since it is highly developed, but why do we rely on our hearing if it is, relative to other species, not as well developed? Because we rely, or at least think we rely, so much on language. So, we see and hear our world. Then what? We analyze it. We use that left side of our brain, the part of our brain that houses intellect, logic, language, etc. to process what we’re experiencing. Humans process and analyze the world and act on the results of our processing and analyzing. How do horses experience their world? As prey animals, horses have evolved to utilize all of their senses to the extent that they’re capable. Their brains gather data from all of their senses and then they feel the world. What? Yes, you read correctly. They feel in their body whether the situation feels good, feels dangerous, feels safe, feels bad, etc. Often horses will first see, smell or hear a change in their environment. If the change doesn’t feel dangerous, they may approach the object to add data from touching the object and tasting it. With all the data, they make a decision based on how their body feels and act on the feeling. What does all of this have to do with interacting with horses? Excellent question. EVERYTHING. 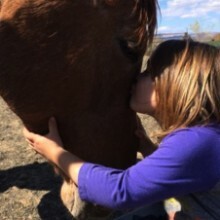 It matters because how we process the world is very different from how horses feel the world. Our differences are especially important to take into consideration when we are playing with our horses to decrease the static (or miscommunications) in our interactions with our horses. The good thing is that we can take simple steps toward experiencing the world more like our horses do. What can our differences cause? In short, our tendency to analyze the world (left brain dominated task) and horses’ tendency to feel the world (right brain dominated task) causes miscommunications, what I call static, in our interactions. Think of the last time you were interacting with a horse and having trouble getting a point across. Odds are, you began analyzing. You analyzed how the horse reacted to you. You analyzed the movements you were making with your body. You think of a different movement to try, different body language. Then notice how the horse reacts to that. All good and understanding steps to take with your horse. Odds are after some trying and failing, trying and failing, you gathered enough data to figure out just the right movement or cue to use and lo and behold, your horse reacted just as you hoped. Nothing seems wrong with this picture I hope, as I don’t intend it to be “wrong,” simply as the mode of operating that we’re used to using. Now, imagine the same situation, but this time, you are feeling your body, the energy in your body. You are matching the feeling and energy in your body to the movement you are seeking in your horse. Your horse, again, does not quite understand. You feel in your body what your horse is feeling in his or her body and play with that feeling to shape it into a similar feeling that matches the movement or response you have in mind. After some experimenting with the feeling, your horse responds how you had hoped. You feel the feeling your horse feels in his or her body that created that response and note it as the feeling that brings that certain response. Both means may come to the same end physically. Both allow for a conversation. In the first scenario, your horse lets you know what body movement on your part in that moment correlates with a responding movement on his or her part. In the second scenario, your horse tells you what the feeling in your body correlates to in his or her body, then educates you about what feeling correlates with what movement in his or her body. Physical sensations and feelings have a more consistent meaning for horses than do body movements. The same body movement with different intentions and physical sensations and feelings can mean entirely different things. The best example that comes to mind for me is our miniature donkey, Sunny. When she backs her hind end up to my horse Uno when he’s crossed her boundary and she is about to kick out at him has an entirely different intention and physical sensation and feeling than when she backs her hind end up to me for scratches on either side of her dock. When you’re operating on “body language” and physical movement with your horse, you’re both operating at the level of effect. When you’re operating on intention, physical sensation, and feeling with your horse, you’re both operating at the level of cause. How can we learn to feel our bodies again? The first step to getting in touch with our bodies again is simple to discuss, but can be uncomfortable in practice. We start with noticing what we’re feeling physically and emotionally. That means not only stiffness, aches, pains, discomfort, etc. that we often ignore, but also what you are feeling emotionally and how it is affecting what you feel physically in your body. The reason it can be an uncomfortable process to begin is because many of us have been ignoring our bodies for quite some time. That is what we’re taught! So, often, what we initially discover is a lot of discomfort. Know that discomfort is ok, discomfort is here to help us. Here are some steps to use to begin your journey. 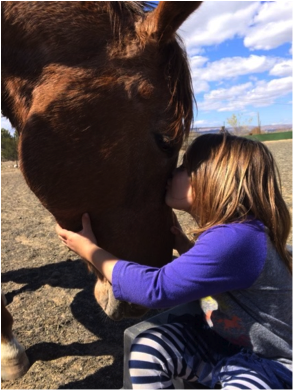 As a note for those who have read 7 Steps for Being Authentic with Your Horse, these 5 steps are the roadmap for completing step 1 of the process for discovering and living your Authenticity. 1. Ask yourself what you’re feeling physically. Focus on a body part at a time. Your feet, your legs, stomach, your back, your chest, your arms, your throat, your head, etc. Notice where you feel tension, aches and/or discomfort. Write down the areas you feel and the sensations that are there. 2. Ask yourself what you’re feeling emotionally. Name the emotions. Write them down. 3. Ask yourself WHERE you’re feeling the emotions from step 2 in your body. Go through each emotion individually. Note where in your body you’re feeling each emotion and what it feels like. 4. Compare to your notes from step 3 to your notes from step 1. Did the emotions and their physical sensations correlate with the tension, aches, and/or discomfort your body was already feeling? Note correlations. We certainly have sensations in our body that are purely physical, as far as aches from old injuries, arthritis, etc. Acknowledge those and let those be. Focus on the physical sensations that seem related to an emotion. 5. As you do this over a length of time, notice consistencies between emotions and the physical sensations in your body. Do you often feel frustration in the same place with the same sensation? Love? Sadness? Stress? Anxiety? These steps will help you to root back into your body as horses are and feel the world like your horse does. Again, for those who read about Authenticity, these 5 steps will get you well on your way to discovering what is Authentic for you and being able to live from that place of Authenticity as horses do. What are your experiences with how you analyze the world versus how your horse feels the world? What are your experiences with working at the level of effects with your horse? What are your experiences of working at the level of cause with your horse? What is your experience in feeling your body? Do you find it easy? Do you resist it? I’d love to hear all about your experiences! Did you like the article? Then comment below!